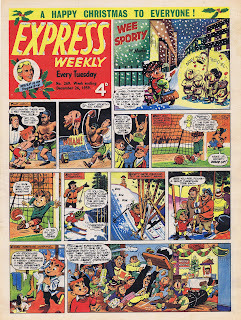 As readers of the recently published Wulf the Briton magnum opus will recall, there was one week in 1959, when Wulf the Briton did not make Express Weekly's front page. This enviable slot had been his regular and unchallenged fiefdom ever since Ron Embleton's masterful development of the strip had threatened to usurp even the pre-eminence of Dan Dare. The week in question was for the issue cover dated December 26th 1959 and by this stage of the game Wulf was on a real roll, with seething rivalries between a breakaway faction of the Brigantes under the leadership of the beautiful and scheming Cartamandua and the remainder of the tribe under the leadership of their king Venutius, cuckolded husband of Cartamandua (although this was never spelled out for obvious reasons) leading to some of the most spectacular battle sequences ever seen in any comic, anytime, anywhere. And if that wasn't enough earlier in the year there had been gladiatorial combat, siege and starvation in the depths of a cruel winter with a vengeful Marius Actus and the 20th legion determined to destroy Wulf and his followers and in the run up to Christmas there had been yet more landings as the forces of Imperial Rome under the command of Agricola set about to bring order to the unruly Brits. But while all that was going on Wulf and his comrades in arms Basta and Greatorix, had their hands full with a bunch of Saxon Vikings who were wreaking havoc on the Northern coasts. 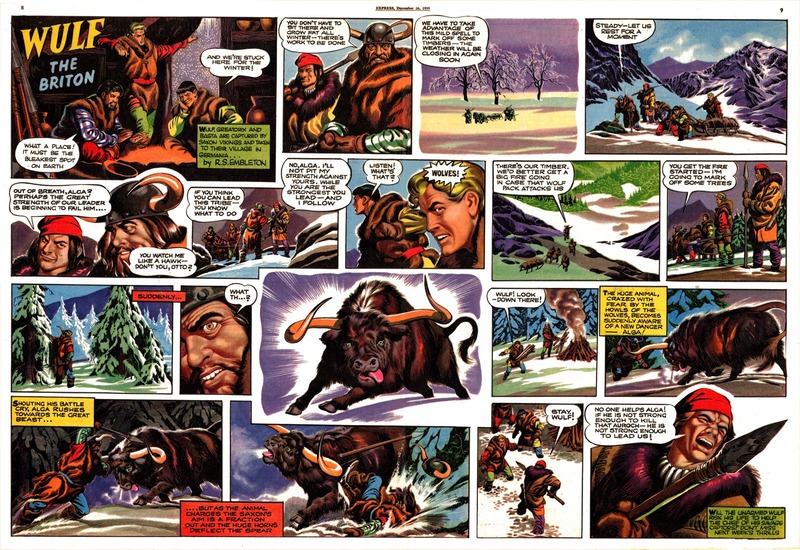 So when my Christmas issue of Express Weekly arrived I was momentarily mystified, but only for a moment as I saw Wulf make his only ever appearance as a truly spectacular, full color double page spread across the center of the comic. The front page was in the meantime reserved for Bill Mevin's Wee Sporty. 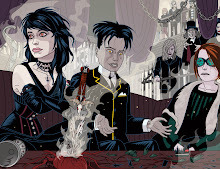 Mevin it should be mentioned was a highly talented illustrator, whose training had included a stint working under the directorship of David Hand, who (according to who you read) was at one time Walt Disney's creative right hand man. Hand left the studio in 1944 somewhat disillusioned in the wake of the strike that had nearly crippled the studio in 1941 and the resultant unionization. (Hand pictured above second from left in the storyboard discussion photograph) Disney never really forgave Hand for leaving and was firmly of the opinion, despite Hand's denials, that his move was as a result of an approach from the UK's Rank Studio. J. Arthur Rank was a man whose ambitions seemed limitless as regards creating an Albionesque version of Hollywood, complete with stars (under contract to Rank) and epic productions, directed by some of the most exciting home grown talents that would see the studio as a credible force in international cinema. The inevitable happened and after work on the full length feature Animal Farm was completed and the studio had failed to secure a distribution deal for it's animated cartoons series Animaland and The Musical Paintbox, the J. Arthur beancounters pulled the rug out from under Hand and his studio and for Mevin and a lot of the other talents, they had to ply their skills elsewhere. For Mevin, the break was something of a blessing in disguise as he was able to develop his own ideas and style rather than expending energy on work which was so heavily Disney influenced (doubtless at J Arthur's behest), that it looked way too dated before it had even been shown to audiences that would inevitably make less than favorable comparisons with the epics being produced in the Mouse Factory. 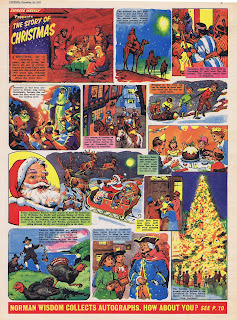 Mevin's style blossomed and moved with the times and included a lot of TV based cartoon strips for such series as Dr Who, Bugs Bunny, Space Patrol and newspaper work such as the Mevin creation The Soapremes and The Perishers. 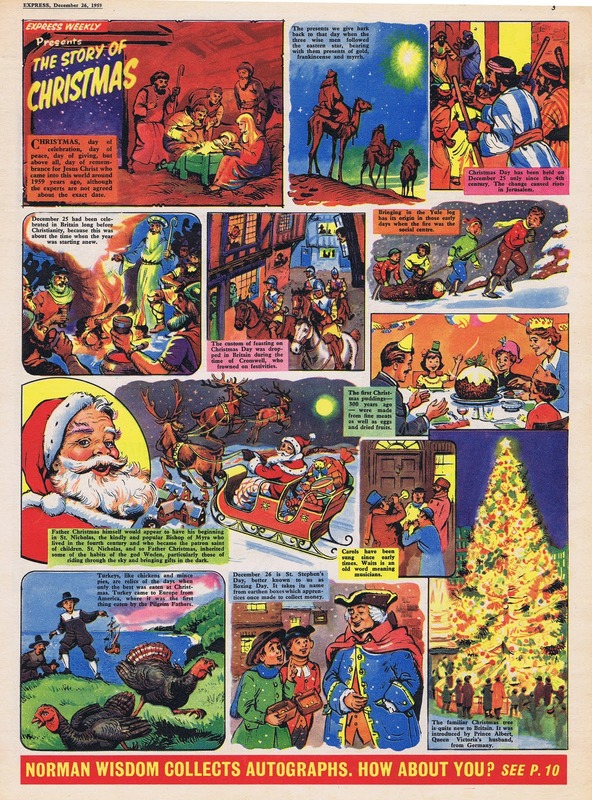 I'm also including a couple more Christmas themed pages from the same issue to help with such things as part games. Courtesy of the inimitable Bill Boffin as drawn by Selby Donnison. Lovely stuff indeed. Fantastic pics. 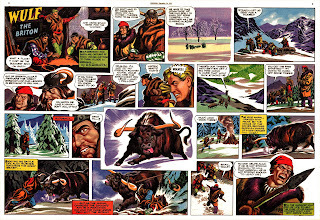 Am I right in thinking Bill Mevin also drew the Hanna-Barbera strips in TV Express Weekly? 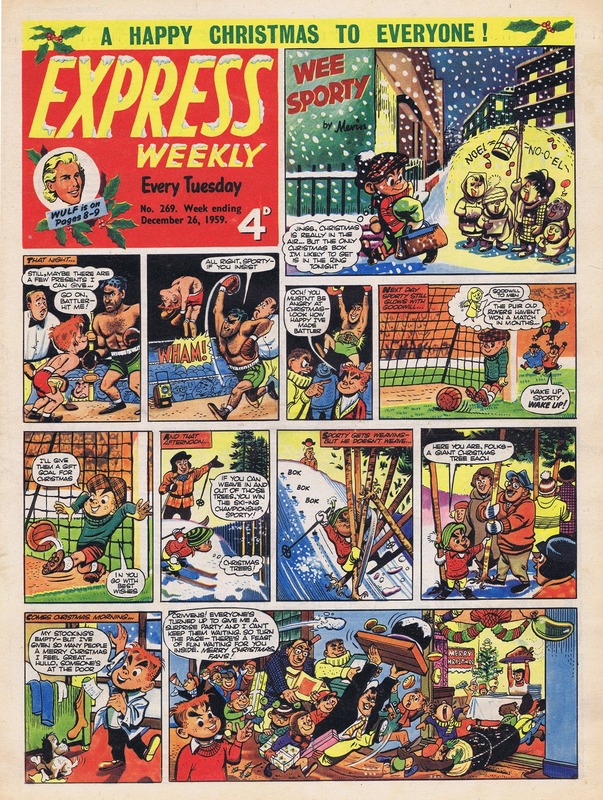 Yes, you're right Kid, when Express Weekly became TV Express Bill was asked to drop Wee Sporty and apply his energies to Huckleberry Hound, Pixie and Dixie and Yogi Bear and they were all beautifully drawn - even better than the US comic versions. And of course we mustn't forget Bill's French Chat with Al. E. Katt! Ever try to automate your free BTC claims with a BTC FAUCET ROTATOR?